It’s a tall order to put kids into a Reality elimination competition and not wind up with tears somewhere along the way. Child Genius on SBS, which attempts to traverse both Reality and Documentary, gives it a red hot go, along with 19 gifted kids aged from 7 – 12. The six part series, screened over 2 weeks, sees Dr. Susan Carland as quizmaster filmed at Chatswood’s Zenith Theatre. Seated in the auditorium are parents and families of the brainy kids who are tested each episode on subjects including Science, Memory, Mathematics, language and more. There are 2 eliminations in the first episode with 1 lucky kid to be dubbed Australia’s brightest child by series end -sorry no $100,000 this time. 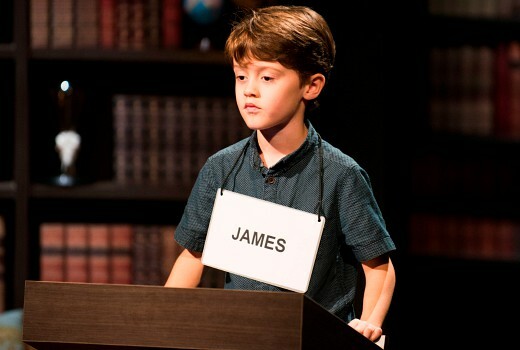 Like The Great Australian Spelling Bee, Are You Smarter than a Fifth Grader? and Little Big Shots, there’s a supportive atmosphere here. “Remember you are going to smash this!” Carland tells them (true, although by definition only 1 truly will). But it’s the kids who make this show, smart beyond their very young years, dripping in diversity, and personality in spades. There’s 7 year old James, who is already studying Year 10 Algebra, and will lose one of his incisor teeth before the day is out. There’s 10 year old Regina, raised by her devoted single dad following the death of her mother, and who had an IQ test at the age of just 2.5 years. There’s 11 year old Manhoor whose Pakistani mother knows the importance of education for girls, having come from a country where it was prioritised for boys. There’s 8 year old Cathy who joined Mensa at the age of 5 (I feel inadequate). And there’s 12 year old Nathan who is so smart at school he frequently feels like an outcast. “A lot of the kids at my school don’t like study, but I do,” Cathy concurs. As his parents observe, the competition is a chance to be amongst their peers, and extend their potential. But it’s a Reality show too, there are a handful of “tiger mums” and “tiger dads” denying they exert their kids too much. The questions are tough. Very tough. The social and ethnic backgrounds are visibly rich, even if the show looks and feels like commercial television. The format, produced by Warner Bros. uses MasterChef-style music to heighten some of the drama, and cameras focus more on those who will either win or lose, leaving the bulk of the kids in the middle confined to glimpses and montages. Thankfully a narrator draws attention to the parents’ view that “doing your best” is more important than winning (although one discerningly notes she wants her child to experience failure, as a character building exercise). Child Genius will probably leave most us feeling like we wasted our youth but take comfort from the knowledge there are some very plucky kids who will be around to take care of us in our senility. 7:30pm Monday, Tuesday, Wednesday on SBS.